By simply using a Web browser (Internet Explorer, Google Chrome, Firefox, etc. ), you can access your Office 365 (O365 hereafter) account through the web, and access your O365 mailbox with Outlook Web App (OWA, the Webmail for O365). 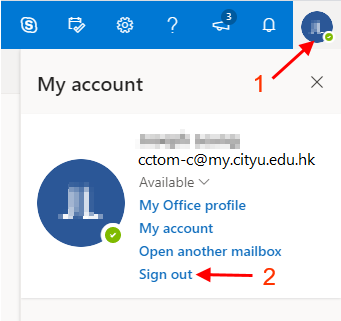 You can access your O365 account by directly go to the "Office 365 for CityU" Sign In page at http://mail.office365.com/ad.cityu.edu.hk. You can also get to this Sign In page by selecting "@my.cityu.edu.hk" from the CityU Email Services home page at http://email.cityu.edu.hk. 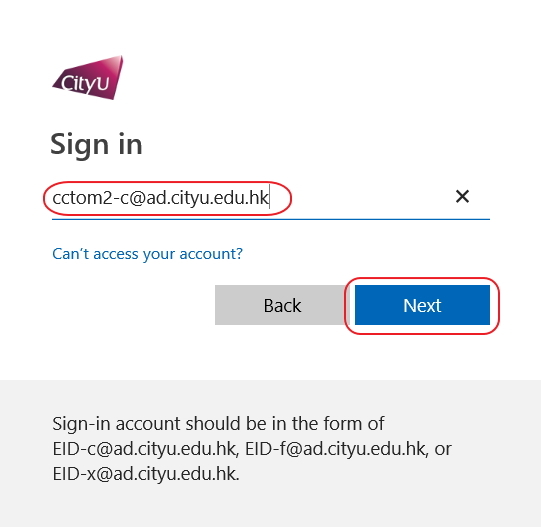 In the Sign In screen, please enter your O365 account-ID in full format as “YourEID–c@ad.cityu.cityu.edu.hk" (e.g. “cctom2-c@ad.cityu.edu.hk”.) and click "Next" to go to the password page. Then enter your O365 Account password and click the [Sign in] button to login your O365 account. After successfully login, you will get into your O365 account mailbox with Outlook Web App (OWA) - a powerful Webmail system. You can use it to read and send e-mail messages, organize contacts, create tasks, and manage your calendar. To know more about OWA, please visit "Getting Started with Outlook Web App" at http://help.outlook.com/en-US/140/bb899531.aspx.